The solid color slip lead is perfect for control and training. Built to last and made in the USA at the Yellow Dog Design facility in North Carolina. Featuring a heavy duty polyester braid with a cushioned cored. not too happy, ordered two leashes and two collars for my dogs. 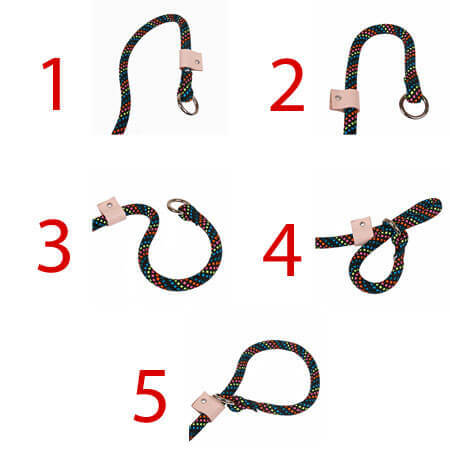 One of the leashes leather stop is not affixed tight enough and keeps slipping down the leash. The material used for the leash also seems to have too much stretch in it. This is a good quality leash. I have 4 dogs and this leash means I don't need a collar to walk a dog since they're different sizes. The length is good and its very comfortable in the hand. Overall I'm extremely satisfied with my purchase. This a great quick, short term use leash. One of my dogs runs out every time the door is open. I keep it by the front door for a fast solution so when the pizza guy comes I don't have to worry about chasing my dog down the street. I use it on my Chihuahua Pug mix. I have big dogs that kept breaking their collars and now with this new slip lead, I know they will not break away. It's strong, durable and pretty. No more loose dogs and security and peace of mind. I love it.